If anyone can tell me what to call this, please speak up. 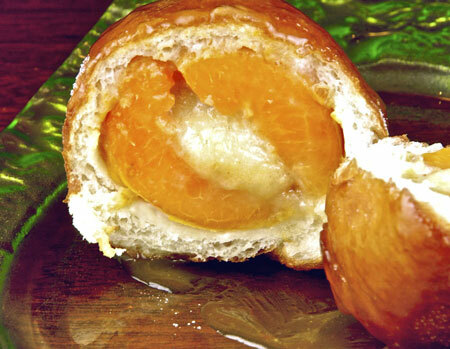 Here we have a whole fresh apricot filled with almond cream, wrapped in lightly sweet yeast dough and deep fried. Topped with rum sauce if you like your… thing… extra decadent. Is it a dumpling? Every definition I could find says a dumpling is either boiled, baked, or pan fried; not deep fried. But then, I am certainly no dumpling expert. Is it a fritter? Fritters are deep fried yes, but aren’t they batter, not dough? Clearly I’m no fritter expert either. Is it a bread? Well, this dough does contain yeast, and I am sending it to Nick (imafoodblog) and Zorra (1x umrühren bitte) for BreadBakingDay #23 (theme: something you haven’t made before), but it’s a stretch, isn’t it? How about a filled doughnut? When I brought these to work, one person pronounced it “the best doughnut I’ve ever had.” I hadn’t thought of them as doughnuts, but she knows more about food than I do. So what do you think? I’m open to other suggestions too. In the meantime, I’m just going to go ahead and call them fritters because I just enjoy saying the word. 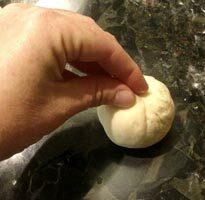 In the bowl of a mixer with a dough hook, combine the dough ingredients. Mix in low speed until combined. Transfer the dough to a lightly buttered container. Cover and ferment for 2 hours at room temperature. Meanwhile, prepare the almond cream. Cream together the butter and sugar, then add the almond flour, flour, rum, and enough milk to yield a cream-cheese-like consistency. Refrigerate until needed. When the dough is almost finished proofing, cut the apricots in half and remove the pits. 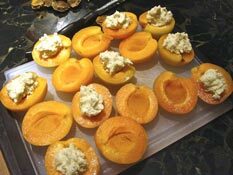 Place about one teaspoon of filling into the center of one half of each apricot and press the halves back together. Turn the dough into a lightly floured counter. 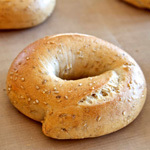 Divide into 16 pieces of 50 grams each. 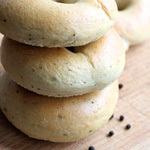 Save the leftover dough for testing your oil temperature. Shape the dough into balls and roll each ball into a disc approximately 10 cm in diameter (this will depend on the size of your apricots). 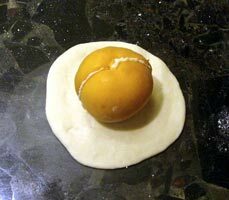 Place an apricot in the center of the disc, stem end up. 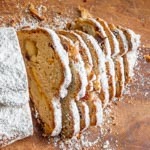 Gather the dough up around the apricot and pinch it securely closed. Place the shaped fritters on a parchment-lined baking sheet. Proof, covered, for 2 hours. Meanwhile, prepare the rum sauce: In a small saucepan, heat the brown sugar and butter over medium heat until the sugar is dissolved. Add the remaining ingredients and cook until slightly reduced and thickened, about 5 minutes. Fry the fritters in batches of about three or four. Turn them so both sides are fried to golden brown. This should take about two minutes per batch. Drain on paper towels. Dust with powdered sugar. Serve warm, drizzled with rum sauce. Might they be beignets? Either way, they look wonderful. Susan, the adventress! It’s fun, isn’t it? What’s the source of your inspiration? 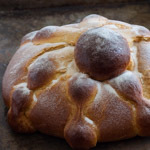 Only thing in my experience that is similar is an apple turnover, where the entire cored apple is wrapped in a pastry dough, but baked not fried (although other “turnovers” are fried – in the south they call them “fried pies”). 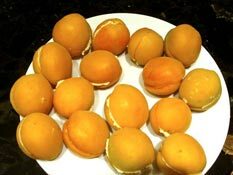 how about apricot delights? that way you don’t even have to worry about if it is this or that. Being German I just have to speak up. 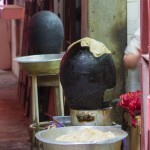 It can be cooked, steamed or fried. Not as fancy as yours, only filled with a cube sugar or a little Marzipan. And there is only vanilla sauce. I would call it “delicious!”. They look incredible. How ever you call it, it looks delicious! I would not call it a dumpling, because the dumplings I know are either boiled, steamed or baked. The only way I know fried dumplings is, that they are first cooked and the next day the leftovers are cut into slices and get fried. I think like Jeremy, that beignets are a good term for it, because wikipedia says that beignets are used as a term for deep fried pastries with a fruit or vegetable filling. I think you invented something new and can call it whatever you want. It sure does sound wonderful! Absolutely inspiring! I think they should be called Apricot Surprise Puffs. That look divine! 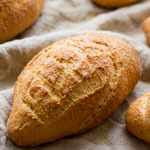 You are so talented and full of ideas on how to use dough. I am giving away my nationality here, but to me they look like a cross between ‘Marillenknödeln’ (Hallo Wic!) and ‘Berlinern’, the latter being deep-fried, jam-filled, yeast-dough… erm, dumplings. But the idea is tantalizing, to say the least. Great post! Whatever the name , it looks gorgeous. Fritter sounds like as good a name as any, but I’d like to taste one or three and think about it some more. That sauce looks divine too! Well, in the south, if it has fruit in it and it’s deep fried, it’s gotta be a pie…a fried pie. And since you added yeast and rum, well, it’s a high-rise, drunken mess of GOOD FRIED PIE! 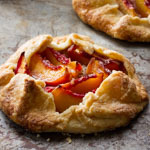 They probably are donuts, but I like the idea of calling them fritters…after all dough is just batter that is a little firmer 🙂 Great idea for how to use fresh apricots. They sound like a perfect summer dessert. You can call them whatever you like, I call them fabulous! well, whatever these are, they look unbelievably delicious. I would like to put in an order for a dozen. Thanks for joining us for this month’s BBD! I have to agree with the German lady. Marillenknodel! Mini Oven has them pictured on her blog on the fresh loaf..I think they are wonderful and your version looks delicous! Wow I totally forgot about BBD! Glad I caught this post, I’ll have to go check out what they are doing now–was this the August submission or September? Can’t wait to try your new invention! This seems to me to be a very sophisticated type of scone (fried yeast bread). 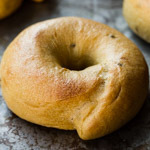 My grandmother used to put sweetened chopped apples inside sweet roll dough, and deep fry it. 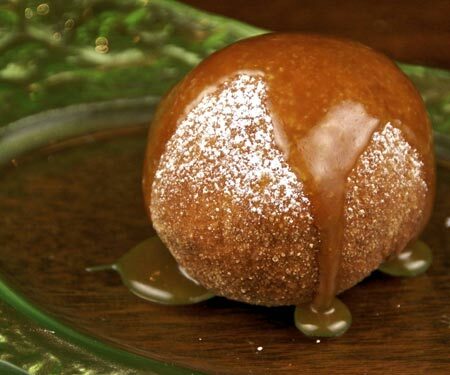 Looks like the best bombolono ever invented. 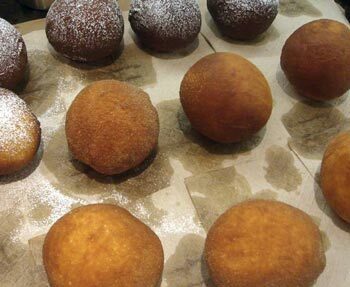 Bomboloni are filled, deep-fried Italian donut-like thingies. These look devine.. yum!! I’m seeing a nice native peach with a raspberry cream cheese filling, and finished with a raspberry sauce. Yum, yummm. In Spain we would call this just: “¡bomba!”. It looks sooooo delicious I can’t look away! oh.my.goodness. Absolute favorite fruit and fillings in these and a good sourdough starter. Hmm, might be worth buying Chilean apricots if only I didn’t need to rid myself of holiday poundage. Will save this recipe for summer fruit extravaganza though. YUM!